Join us for an evening with Philip K. Howard, who will talk about his new book, TRY COMMON SENSE: Replacing the Failed Ideologies of Right and Left, with Laura Walker, President and CEO of New York Public Radio. 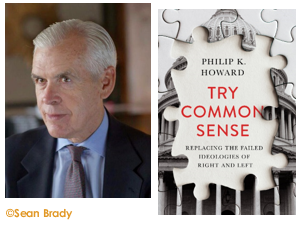 Philip K. Howard, a lawyer and civic leader, is the founder of Common Good, a nonprofit that advocates for simplifying government. Laura Walker is a recognized leader, writer and speaker on media, culture and business. She is the recipient of an Edward R. Murrow Award and was named one of New York City’s Most Powerful Women by Crain’s New York Business in 2009 and 2017.